I have spent a great deal of time recently thinking, talking and writing about my ‘inner child‘, and although I know this area is not ‘concluded’, it feels as though my therapy is moving onto other things, at least for now. I am sure it will come back as a matter for further reflection, as unresolved issues always do – after all, I still need to find a way to at least like, if not love, that inner child (and other people’s!). 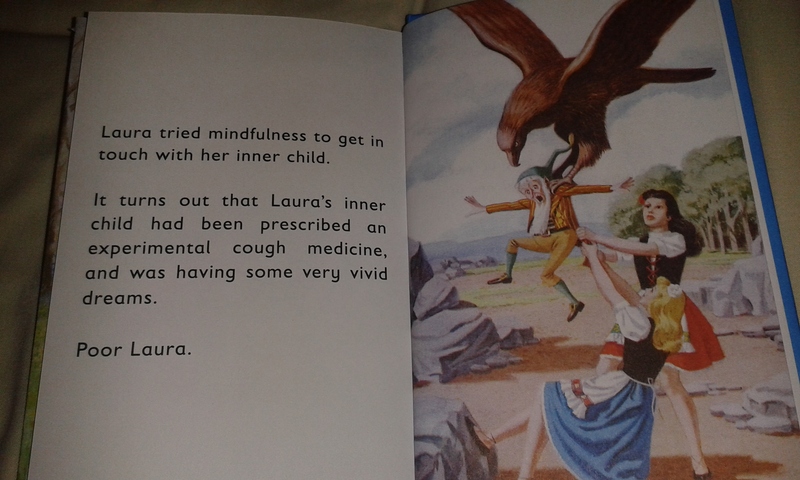 Categories: Poems, quotes and music | Tags: borderline personality disorder, BPD, inner child, ladybird books for grown-ups, mental health, mental illness, mindfulness, parody of mindfulness, snow white and rose red, therapy | Permalink. There is a view of the nature of philosophy that claims that it is not about discovering philosophical knowledge or finding solutions to philosophical problems; but that it is a battle against the bewitchment of intelligence by means of language. “There is not a single philosophical method, though there are indeed methods, different therapies, as it were”. In that view, philosophy, like psychotherapy, is a ‘talking cure’ – one in which it is not knowledge but understanding that is the key to living freely, as a whole person. “A philosophical problem has the form: ‘I don’t know my way about’” – in life, one might say, as well as in thought. In this model, the task of both philosophy and therapy is to try and use different frameworks to view what is already there, and in order to do that it’s vital to understand how the language that we use – including pictorial language – can lead us astray. Pictures, analogies, metaphors – can be incredibly powerful. They give us a way of talking about our experiences that shows what those experiences are like. But because we are human, with language and imagination, those pictures and analogies suggest other pictures, metaphors and analogies to us. We get carried along by a train of thought and very soon, we have turned a helpful way of seeing things and of showing what we see, into a landscape of pseudo-scientific facts and causal mechanisms. We all need ways of talking about things – but the danger lies in believing that our way of talking tells us something factual about the things that we are talking about. A concept is not an object – and yet the confusion between the two is frequent in psychoanalysis. Talking about an ‘inner’ versus an ‘outer’ world may be a handy shortcut for referring to ‘goings on of the mind’, but the very language of ‘inner versus outer’ has furnished psychotherapy with a landscape littered with internal objects, mental processes, and psychic causal mechanisms, despite the fact that when I am doing psychotherapy or philosophy I am not engaged in the same sort of activity as when I am doing science. That is not to deny that there can be scientific, physical or genetic causes to psychological difficulties – it is simply to say that applying the language and framework of science to doing and participating in psychotherapy is like applying the rules of football to a game of chess. Picture, analogies, metaphors – can be incredibly powerful, and can influence how we think and feel, and how we behave. But I’m not just talking about the difference between being a ‘glass-half-empty’ or a ‘glass-half-full’ kind of person. I’m talking about the difference between thinking of life as a glass, as compared to a river, or a tree, or an onion. Each analogy is not just a snapshot, it is a route-map, a train of thought, and subsequently of action. If I think of life as a glass, it is something that needs to be filled; it becomes about accumulation, whether that is of possessions, people, or happiness. My cup may be full to overflowing, and I may drink to the dregs and have my fill. I will be content, in other words, if the volume has been satisfactory, and I will act to increase that volume. If life is a river I may worry less about what I do, and may be more content to be carried along with the experience; I may be drawn inexorably to the sea, to my final purpose, gathering leaves and twigs and gaining tributaries and companions along the way. If life is a tree I may focus on personal growth; if it is an onion I may focus on trying to peel back the layers either of myself or of the world around me, to discover ‘what lies beneath’. We take the first step – thinking of life as a glass –because it appeals, because it ‘makes sense to us’. But from that first step the subsequent ones flow in a way which seems independent of us and causally determined; in a way which seems factual. And so we forget that this was, in the first instance, simply a picture that appealed to us. But by that stage, the picture is holding us captive because its language has a hold on us, and keeps repeating itself to us, over and over. There is a picture that holds me captive – it is a picture of a ‘pit of need’ inside me. This picture, this language, is the way I describe to myself a certain set of feelings. Feelings of longing and desperation; of wanting warmth and closeness, acceptance and connection. Over the last few months, those feelings have been associated with numerous instances of what my therapist has called my ‘subconscious breaking through the cracks’. Instances of impulsive action, regretted; of doing, without thinking; of boundaries pushed or broken. Instances leading to shame and self-loathing. The thing about a ‘pit’ is this – it cries out to be filled. The very language I use to describe my feelings seems to imply that I need to do something – I need to seek that connection, in the hope that there will be an outpouring of love that will fill that pit, and make those feelings of longing go away. The pit cries out to be filled – it aims at action and future resolution, not at thought and reflection. It gives the illusion of control – because it’s easy to envisage a pit that, with help, can be made a little less empty. And so the pit attaches itself to a person – it becomes about the person with whom a connection is sought, and who can help to fill it. It becomes almost impossible to imagine that the pit may have nothing to do with that person at all – that the need may be not for something in the future or the here and now, but for a connection and an acceptance that should have taken place in the past. My therapist has often told me that therapy cannot make up for the past, or replace what I did not have. My therapist may ‘stand for’ the mother I may have needed, or represent her in some way – but she cannot be that mother, or simply give me the experience I was missing. And by constantly wanting therapy, and her, to be something they are not, and by constantly fighting against the boundaries of therapy, I am not making the most of what it has to offer and I am not fully able to enjoy and appreciate it. It is never enough. I have often read that one must grieve what was lost or was missing – but I have no idea how to grieve something that wasn’t there; something that is nebulous and unremembered. Save that, as my therapist has pointed out, it is remembered by virtue of the transference that is experienced during sessions. Even so, I have only recently learned how to grieve a person rather than bury feelings of loss – and I have no idea how to apply those lessons to grieving a lack of unconditional acceptance and connection in my past. But what I have learned about grief, is this – that you have to sit tight, and weather the storm. That you have to be open to it and be pummeled by it and let it have its way with you. Grief comes in waves and you have no control over it; you have to let it wash over you, knowing that it will do so, but that more waves will come. And eventually, the waves will hit less often, and when they do you will feel less and less as though you are drowning. Eventually, it will be the good memories that will help you keep your head above water rather than weighing you down with a sense of loss. And then one day you will be able to smile at the memories, and enjoy them, and there will be an aching, and only the distant bodily remembering of the bruising and the storm. What if when I felt those feelings of longing and desperation, of desire for connection and acceptance – I could think of them as a type of grief, and not as a pit of need? What if I could think of them as a wave hitting me, and washing over me, rather than an empty hole inside me, needing to be filled? What if I could just sit and wait, rather than be impelled to act? What if I could recognise that the feelings were not about something that needed to happen now, but about something that never did? And therefore that though the person who shares my space (mental or physical) while I am experiencing those things may be someone wonderful and important and maybe even someone that I love – they may still be completely distinct from that sense of fierce need and hunger? What if I can change the language that I use to talk about these feelings, so that the picture of a pit of need no longer holds me captive? If I can instead use the language of a wave of grief, will I be able to break out of this cycle of acting when I should wait, and of acting leading to shame and regret? It’s worth a try, purely on those grounds. But it’s also worth a try because of the potential end-game – if the grief analogy is followed all the way through. It’s worth a try if, eventually, that fierce longing and desperation can be replaced by an appreciation, enjoyment and a true valuing of what I do have – whether in therapy or elsewhere. The people I am connected to may not be able to pour themselves out in the way that I might think I need them to – but they can be there for me none-the-less, and perhaps they can be my equivalent of ‘good memories’ to enjoy, once the waves of grief over the past, have done their work. Categories: Therapy | Tags: borderline personality disorder, BPD, mental health, mental illness, psychotherapy and philosophy, the talking cure, therapeutic relationship, therapy, therapy and the limits of language, wittgenstein | Permalink. On this Remembrance Sunday, I am remembering a man who was ahead of his time in the care and understanding of those with mental illness. W. H. R. Rivers was an anthropologist, neurologist, ethnologist and psychiatrist, known, amongst other things, for treating World War I soldiers suffering from shell-shock – what we would now call a form of Post-Traumatic Stress Disorder. Rivers’ war-time work at Craiglockhart War Hospital in Scotland, and his meeting with the poets Siegfried Sassoon (with whom he developed a life-long friendship) and Wilfred Owen, have been fictionalised in Pat Barker’s well-known and award-winning ‘Regeneration Trilogy’. But Dr Rivers stands out not because he had the good fortune to encounter and treat two of the greatest war poets that have ever lived: but because he was a pioneer in his field (by applying psychoanalysis to soldiers suffering from neurosis as a result of war experiences); and because he defied the beliefs and treatments of his time. At a time when shell-shock was considered ‘not a real illness’, and the only ‘cure’ was electroschock therapy (described by another war poet, Ivor Gurney, in the post-war period – see my previous post ‘Strange Hells – Remembrance Sunday‘), he instead encouraged his patients to talk about their experiences and their emotions. 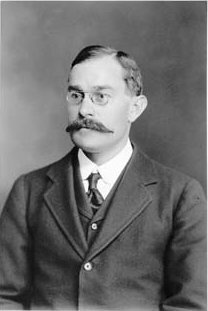 After the war, Rivers returned to Cambridge, where he had previously held a lectureship. He died on 4 June 1922, and his ashes now rest in the Ascension Parish Burial Ground in Cambridge. “….The ground held firmly; I was no more dumb. The carpet was holy that my feet were on…. Categories: Poems, quotes and music | Tags: borderline personality disorder, BPD, mental health, mental illness, poetry, remembrance sunday, therapeutic relationship, therapy, w h r rivers, world war I | Permalink. 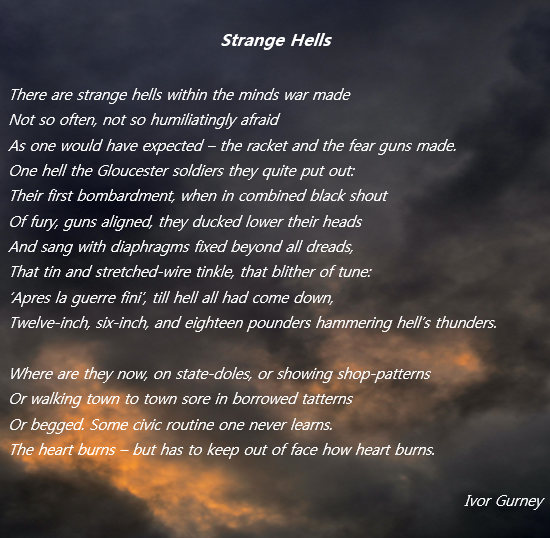 Ivor Gurney (1890-1937) was an English composer and poet who fought in, and survived, the First World War. He wrote several hundred poems, songs and instrumental pieces, and is regarded as one of the foremost World War I poets. However, he was troubled by severe mood swings from his teenage years, and suffered his first breakdown in 1913. Another breakdown followed in 1918, a few months after his return from the Western Front. Although he continued to write poetry and music prolifically, his mental health continued to deteriorate and in 1922 his family had him declared insane. He spent the last fifteen years of his life in psychiatric hospitals and died in 1937 of tuberculosis, at the City of London Mental Hospital. Although for a number of years it was believed that Gurney suffered from paranoid schizophrenia, it is now believed that he had bipolar disorder. Recently it has been argued that despite the horror of combat, the discipline, comradeship and sense of belonging of the army, may have temporarily helped Gurney’s mental health. Gurney served both on the Somme and at Passchendaele – two of the most infamous battlegrounds of WWI. In 1917 he wrote ‘Strange Hells’ – a beautiful, surprising poem. ‘There are strange hells within the minds war made‘, but at the same time, ‘not so often, not so humiliatingly afraid as one would have expected‘. Perhaps he’d known stranger and more frightening hells before he entered battle. He certainly did after battle. His poem ‘To God’ is a heartbreaking cry for death in a situation that he felt was intolerable. If we read the last lines of the poem in isolation – ‘Not half can be written of cruelty of man, on man, not often such evil guessed as between man and man‘ – we might think they were describing his war experience. But they appear in the context of a poem about his experience of hospitalisation, in which he was ‘praying for death, death, death, and dreadful is the indrawing or out-breathing of breath‘. ‘And there is a dreadful hell within me‘. 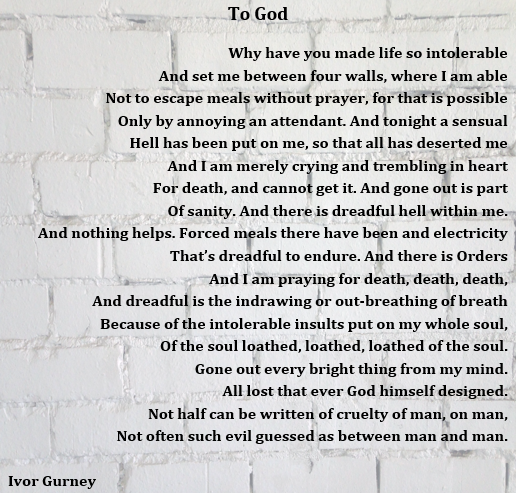 Gurney’s description of his depression and longing for death will be familiar to many – I have never been an inpatient, but so many of the emotions in this poem are familiar to me, including the feeling of ‘crying and trembling in heart for death, and cannot get it‘. On this Remembrance Sunday, I want to remember a man who knew first-hand both the hell of a wartime battlefield, and the hell of his own internal battles with mental illness. I hope these poems move you, as they did me. Categories: Poems, quotes and music | Tags: borderline personality disorder, BPD, ivor gurney, mental health, mental illness, poetry, remembrance sunday | Permalink. I have been reminded quite forcefully this week, of the fact that I have BPD. Not that it’s particularly easy to forget; but I think it’s fair to say that over the last year or so, the ‘label’ I clung onto so fiercely before (as without it I felt I lacked definition), has seemed a little less important. In therapy I feel I have moved away from trying to understand my ‘symptoms’, to trying to understand my own set of circumstances and past experiences, which are ultimately unique to me. Similarly, my blog posts have moved, I think, from being primarily about my experience of BPD, to being more about my experience of therapy and of life, of which BPD symptoms are a part. But this week, I feel I am a walking example of a ‘textbook borderline’ – without meaning to cause offence, and in full recognition of the fact that generalisations are often not helpful. Though I know I have made progress in therapy, put me in particular situations and they are guaranteed, it seems, to provoke certain feelings and reactions within me which are par for the course for my ‘condition’. I believe in recovery – but more and more I’m coming to realise that it’s not about symptom elimination; but about managing symptoms and a gradual reduction in their intensity and duration. I think perhaps I will always have a propensity to react in certain ways – but perhaps in future those reactions will not be as painful or as long-lasting as they are now. I hate the emotions that I am having. And I hate that they are happening to me. I hate feeling so incredibly needy, and I hate it even more when that neediness is directed at others apart from my therapist. For one thing, I cannot talk to those others about how I am feeling. For another, it feels like a betrayal of my therapist. In a painful double-bind, I am yearning to feel special to those others, and at the same time I yearn for my therapist to know how special she is to me. I have an urge to be mothered by those others – to be wrapped up in their arms. But I feel guilty because it is my therapist’s mothering touch that I am most desperate for, and it feels as though I am diminishing that desire by daring to feel it in relation to someone else. What I suddenly realised this week, is that these emotions have hit me so forcefully not because they went away and have suddenly come back; but because for quite a long time now, they have been focused almost exclusively on my therapist, who has helped me to talk about them and work through them. But now they have spilled out, once again, onto others, and the ease with which that has happened, has shocked me. This week reminded me what a powerful trigger ‘confession’ can be – and that allowing myself to trust people and open up to them, can pull me into a powerful web of emotions. It can open up a ‘pit of need’ (as described in my post ‘BPD and emptiness‘) that feels utterly bottomless and futile. And because it feels so futile, my impulse is to do whatever I can to push it away. It’s been a long time since I deactivated my Facebook account in an attempt to pull away from interaction and to try and deny that sense of need – but I did it again this weekend. The neediness and the desire for closeness are very painful, and they have been ever present during this last week. But at least I don’t feel as ashamed of those emotions, as I do of the ones that accompany them. I want to feel mothered; but I also want to feel special and unique. Which I can just about accept, were it not for the fact that this leads to a sense of ‘competition’ that feels completely wrong. In order to feel special and to be loved I have to be ‘more than’ any others who might also be vying for attention. Because of my parents’ emphasis on achievement when I was growing up, ‘more than’ has often meant ‘more intelligent’ or ‘more able than’. But – and I find this utterly reprehensible about myself – it can also mean, when it comes to those who know about my diagnosis, ‘more disturbed, more ill, more troubled’. As if I won’t merit others’ attention or their interest if I am well, or doing better than I was. And of course, as well as the desire to be ‘mother’s favoured child’, there is a feeling of jealousy and sibling rivalry towards others in a similar position. I find this particularly difficult as I have no siblings and have never dealt with these emotions before – and yet is it unmistakable that that is what they are. It seems bad enough to feel that jealousy in relation to my therapist’s other clients, who I don’t know – it seems even worse to feel it towards friends or acquaintances. I should emphasize that this is how it seems to me – I am not suggesting that it is actually wrong or shameful to have these feelings. I know that my therapist would encourage me to stop judging myself for having them. And yet I have a mental picture of my ‘neediness’ which illustrates how I feel about it, emotionally– it is an insect crawling along, with its antennae always searching for someone who might be able to fill that need, and its tail ready to trap and sting. It feels like a parasite, and though my emotional storm is entirely internal, I am so fearful that if any hint of it escapes, it will be repellent to others. It feels as though so many of my human interactions this week have been tinged with the sense that they can never be enough – and that makes me incredibly sad. 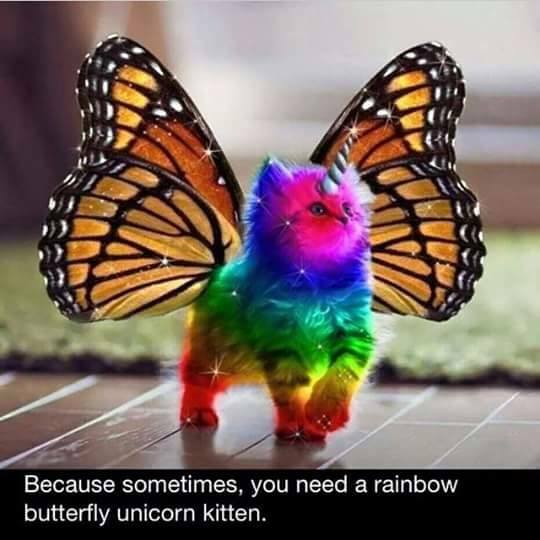 Whether that’s the intimate session with my therapist which ended with a lovely sense of connection; or the fun, exciting and affirming email exchange with a fellow-blogger; or the interesting discussions on mental health with friends and colleagues. Interactions that felt caring, satisfying and enriching; and yet also left me feeling empty, and needing something more. Interactions that left me wondering: if you knew that while we were engaged in casual conversation, I was wishing that you would take me in your arms and hold me – would you still want to be in the same room as me tomorrow? If you knew that behind the sense of fun and the stimulating conversation, was a powerful desire for emotional connection – would you risk that conversation again? And if you knew that sometimes when I’m close to you, I just want to climb inside your heart and be kept safe there…..
My therapist DOES know. And she still’s there. But I’m not so sure about everybody else. Categories: Attachment and relationships | Tags: borderline personality disorder, BPD, desire for connection, emptiness, mental health, mental illness, neediness, pit of need, therapeutic relationship, therapy | Permalink. I recently saw Pixar’s latest film, ‘Inside Out’. A friend of mine told me it was a ‘tough watch’ for someone with emotional problems – that’s me – so I went prepared with lots of tissues and the hope that I might learn a thing or two not just about how to talk to my kids about their emotions, but about how to manage my own. I wasn’t disappointed. The film is about a young girl, Riley, who moves across America for her father’s work, leaving her friends and hobbies behind. The film’s protagonists are Riley’s emotions – Joy (Gold), Sadness (Blue), Anger (Red), Fear (Purple) and Disgust (Green). Riley’s memories are shown as coloured balls (the colour representing the emotion associated with them), and the key aspects of her personality are moulded by ‘core memories’ of special life events. It’s a film that appeals as much to adults as to children, and it hit home for me in a number of ways. Soon after Riley moves across country, Joy decides to marginalise Sadness in order to protect Riley from her. She is motivated by wanting to please Riley’s mother, who tells Riley it will be easier for her father if they can both appear happy. I winced in my seat – because who hasn’t said something similar to their own children on occasion? I know I have. And yet what is the hidden message we may inadvertently give our children, when we ask them to ‘pretend’ in that way? “Your emotions are not as important as those of someone else; you are responsible for someone else’s happiness”. I believe strongly in ‘good-enough’ parenting, and that there is far too much unnecessary parental guilt around – I do not want to add to it. Children are resilient, parental bonds are strong; we build and rebuild our relationships with our children every day. But for me, that scene was a lesson in remembering to always allow our children to be children, however difficult that may be for us. Emotionally developed adults have a sense of self-worth which enables them to validate their own emotions and to self-soothe, which means that sometimes they can ‘hide’ their emotions for a time, for the benefit of another. But children do not yet have that capacity – they are still learning who they are, and how much they are worth. We cannot, as Riley’s mother did, try and make them our emotional allies, however well-intentioned we might be. Our kids’ emotions might feel threatening to us (particularly if we feel unhappy or stressed) – but that is our burden to bear. We need to open our arms to their emotions, so that one day, they can do the very same thing for themselves, and then also for others. Perhaps because it deals with emotions and one’s ‘inner world’ the film has sometimes been portrayed as being about mental illness. However, my own view is that ‘Inside Out’ is not about mental illness – it is about mental wellness, and the role our emotions play in that. This is not to deny that it may speak powerfully to those who have depression, bipolar, or another mental health condition (in my own case, borderline personality disorder). It’s not even to deny that Riley herself shows signs of slipping into depression as the film goes on (feeling numb, becoming a ‘different person’). But to see the film as being specifically about mental illness, risks pathologizing key life experiences and emotions that we will all end up dealing with. A significant minority of the population struggles with mental illness – but we all have mental health, and mental well-being is fundamental to every one of us. My own mental well-being is affected frequently by the pain that accompanies the joy of my children’s ‘milestone moments’. As any parent will know, these moments have a habit of reminding us that our ‘little people’ will not be little for very long. The question I ask myself repeatedly, is: “how can I fix this, so that my experience of joy is unsullied?”. And so for me, what I see as the key message of ‘Inside Out’, could be life-changing. And the message is this: that there is no joy without sadness, and accepting that leads to freedom to be ourselves, and ultimately to greater fulfilment. Many of us spend a lifetime trying to avoid difficult or unpleasant emotions, and the attitude that sadness is an undesirable state of being, even ‘wrong’, permeates the very air we breathe. It’s certainly one that I grew up with. And so many of us invest a great deal of energy in trying to pretend we are okay when we are not – both to protect others and ourselves. But it is precisely that effort and the lack of coherence between what we appear to be, and what we really are, that leads, as in Riley’s case, to a deterioration in mental well-being. You will hear many parents say that all they want for their children is that they are happy. But I think the triumphal point of the film was when Riley generated a core memory that was both gold and blue – a mixture of joy and sadness. The moment when she integrated those experiences and, on some level, recognised both as a fundamental part of herself. Both joy and sadness had made her who she was – and she was so much the richer for it. This film has shown me that when I experience joy tinged with sadness my question should not be ‘how can I fix this’, but ‘how can I accept this’. I do not wish sadness on my children – but I know that it will be always be a part of their lives. My wish for them is that they can accept it, feel it, make it a part of themselves, and allow it to help them grow – into the most authentic version of themselves that they can be. Categories: Parenting, Poems, quotes and music | Tags: borderline personality disorder, BPD, depression, Inside Out and mental health, Inside Out film, joy and sadness, mental health, mental illness, mental wellbeing, mental wellness | Permalink.